Do the wigs come with the cut like the picture? What is a Preplucked Hairline and Widow's Peak? Will my wig fall off when the wind blowing? Is the wig supplied with glue and other accessories? What kind of glue can I use if I'm with sensitive skin? Who are suitable for these wigs? Can I wear this wig if my head is full of hair? Can I wear this wig if my head is with no hair absolutely? Can I attach the wig by myself without any help in the salon? What is a wig grip and why you need wig grip when installing the wig? Can I do hot curling or flat ironing on the wavy or curly hairs? Why do straightening wavy/curly hair cause damage to your wig produced by human hair? Can I use blow dryer to dry my hair after washing? Can I shower or swim with lace wig on? How can I care on our hair after swimming? Is the wig available for being parted as I wish? Can I wear my lace wig in a high ponytail? How do I pay for the extra cost? How shall I prevent the lace wig from tangling? Who can wear the hair extensions? Can I apply my own hair extension? Do they look the same as real hair? Are they difficult to maintain? What type of hair is used for hair extensions? Is someone else's hair hygienic to use? Can I use a blow dryer, straightener or tongs on my extensions? Can I re-use extension hair? How are hair extensions made? How can I tell quality hair extensions? Bleached knots is a chemical process to make the wig look more natural by bleaching the black hair knot crochetted to the lace cap to a lighter one, similar to our own scalp color . One con of bleached knots process is that it would cause hair damage and shedding due to chemical is used during bleached knots process. So we highly suggest you to bleach knots just around the perimeter . At the same time, you could use the foundation or concealer of your skin tone to lighten the knots on full cap tp get the same natural look. No. You can choose your cut style when placing orders on website. If you want the same cut style as the pictures on our website, you should leave a message to notify us when placing your order. 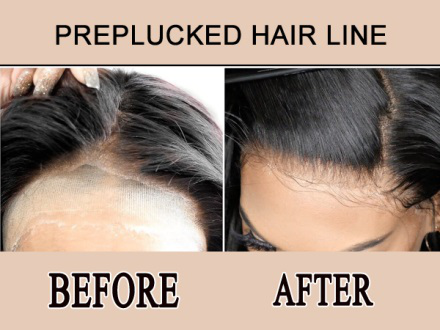 A preplucked hairline is a natural hairline with right amount of hair along the hairline area which looks like the human hair wig is growing from the scalp. Usually a human hair wig without plucked hairline is always dense and thick at the hairline area . There is a lot of work to be done if you want to get a more natural look after you receive the human hair wig , but with the preplucked hairline, the hair along the hairline area are already plucked before shipping which gives it a more natural look . A Widow's peak is M-shaped hairline or Pointed Hairline. 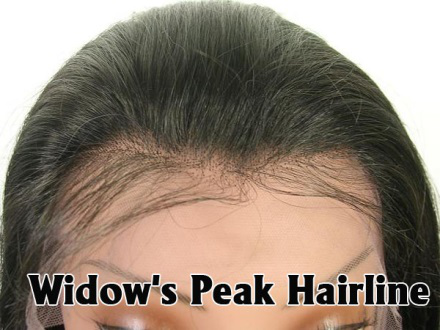 If your front hairlines make the shape of M or come down in point above forehead , you could get your human hair wig customized to a Widow's Peak for a more natural look. Our professional hair stylists design the lace wigs, who are with over 10 years experience. BTW, highlight and mixed color are only available in custom wigs. If you need other hair colors or hair length, you may want to choose a custom wig. The silky straight hair texture is the natural state of the Indian Hair as it comes from the donor. It is look like the wig of white people. If you are Caucasian,we recommend you choose silky texture. what's the difference among Chinese, Indian and Brazilian hair? Similarities Each texture can be processed in wavy, straight or curly. A co-wash is recommended on all types of hair. Differences Brazilian Hair - It comes from the pacific of Brazil and its derived in different lengths and natural colors. This hair is silkier and shinier in texture than Indian Hair. This hair has a shiny appearance and feel. The Straight textures are not bone straight but tends to have some light waves in it. This hair holds curls very well and tends to hold curls longer than the Indian Hair.This type of hair is usually soft and smooth. Texture may vary from natural straight to natural full bouncy body wave. The use of this type of hair is popular in most West-African countries. Brazilian hair is good for all hairstyles. It holds curls beautifully. Indian Hair - This is 100% Indian virgin human hair and it comes from the Indian Race.Indian hair tends to dry into a beautiful wave which ranges from a slight wave to very wavy. The hair holds curls very well but they do loosen slightly. It is very soft and lustrous, and thinner than Chinese hair. The natural straight hair texture can wave up when wet. Great for all textures (yaki or silky), specially for natural wave and natural straight. Chinese Hair- Should be chosen if you want a very straight wig that is naturally shiny and doesn’t hold curls. 1. The Silk top material is approximately 5 by 5 inch of silk material on the crown area. The silk material does not cover the entire wig. These two caps are with lace all around the perimeter and available for you to wear your hair in updos and high ponytails. When the caps are glued down, the wig will have a natural hairline all around the perimeter. The unit can be parted anywhere as you wish. We suggest you to do a skin test before use if you are with sensitive skin. Most people are all right with the glues and tapes. However, if you have sensitive skin, we advise you to start with the Spirit Gum or Hollisters Medical Adhesive. No. The wig is not supplied with free and other accessories, only user instructions in the package. If you are with sensitive skin, we advise you to start from the Spirit Gum or Hollisters Medical Adhesive, which can be bought on the internet. We suggest you to do a skin test before use if you are with sensitive skin. Most people are all right with the glues and tapes. Yes, you can also wear the hair after braiding your own hair in small cornrows by beehive or straight back. Also you can wrap your hair back simply. Yes. These wigs are perfect choice for women with hair loss caused by cancer, alopecia and so on. Many women will renew their confidence when wearing full lace wig. If you are new with the lace wig, we suggest you to seek help from experienced stylist in salon for attachment. However, we have included the instruction how to attach the wig easily, and you can attach the wig by yourself following our instruction. * Simple and it works. Wig Grip secures your wig without any glue, gel or elastic band to keep the wig from sliding and in place. No. For wavy or curly hairs, these lace wigs have been already processed by a perm for wave or curl. So, it is not recommended to hot curl or flat iron the lace wigs again to avoid any over processing. For straight, Yaki perm straight and light Yak hair, you can use hot curling or flat ironing, because these hairs are naturally curly or wavy. You may use the perm to straightening your wavy or curly hair for long-lasting, however, heating on perm might cause damage to your hair. Our lace wig is made by 100% human hair and available for any styling like your own hair. You can choose to perm the wig as you wish. However, we cannot give any suggestions how you can perm the wig. You shall choose the procedure you learned to style the hair. No, we do recommend you to let your hair dry naturally, since blow dryer may cause damage to your hair. Yes, you definitely can. Well! You had better put waterproof adhesive or tape on your lace cap when you swim. It is recommended you to wash it after you swim with it. Anyway, you can exercise in your wig. You can wear your lace wig when swimming. However, your hair may be damaged by chlorine and salt water and these damages cannot be repaired. So, it is suggested not to make your expensive lace wig touched with chlorine or salt water. If you suggest to do this, you should make sure that the hair will be washed and deep conditioned once after your swimming. First, open the page of extra cost, in which you will find the set price is $1. First, you need to know your 'coupon code'. Then, follow our guide to use your coupon when you are ready to check out. Go to 'shopping cart page' and press 'check out' button to start processing of checkout. And at the second step of the checkout process, copy your coupon code and paste it in the blank of "Discount Coupon" area. And then scroll down the page, choose payment options then press 'continue' button. Press 'confirm the order' button, to complete. All items in Divaswigs.com are FREE SHIPPING WORLDWIDE. We share a strategic cooperation relationship with the world's largest express company UPS. Most of our package is delivered by UPS, and then are DHL, FedEx. (ALL ARE FREE SHIPPING). Once your order is shipped out, you will receive an email about the tracking number. If you don't tell us in the time frame ,we will ship your order to your initial shipping address, if you can not receive it we are not responsible for it. We can not deliver orders to P.O. Box or APO/FPO address. Yes, you can. However, this is only available for custom orders and extra charge shall be paid for the rush orders. Normal production time is 25-30 working days and rush order is 15-20 working days. You may choose a satin pillowcase for night sleep in order to avoid friction. Cotton pillowcases with fibers rub against your hair, oppositely, satin pillowcases let the hair slip freely. Also for cheaper cost, you can place a satin petticoat or nightie over your cotton pillows. However, the effects will be also obviously different. Do not wear any barrettes or clips on your hair overnight as these accessories will be difficult to remove after one night. Also during washing hair, tangles may be also created due to scrubbing the hair. Before showering, you need to detangle the hair and apply Silicon Mix Revitalizing Shampoo on your scalp. If you rinse the Silicon Mix Revitalizing Shampoo onto the hair enough, there is no need to scrub the hair, and by this, the hair will be cleaned well. Later, you shall comb through your hair with a wide-toothed comb and make the conditioner rinse onto your hair. By this way, you do not need to take detangling on wet hair. Let the hair dry naturally instead of rubbing it by a towel. Removing Knots From Hair: Bobble-tipped brushes might cause damage to your hair and can not remove any knots as you suppose. You shall use your fingers or a wide-toothed comb to detangle the hair starting from the bottom several inches to up towards. You can begin with the bottom of a knot and remove it out, instead of pulling it widely. After detangling, you shall take a boar bristle brush for polishing and protecting your hair from damage. hair extensions are hair that is attached to your own hair to give you the appearance and feel of longer hair. Hair extension can be made from synthetic hair or from real human hair. 1. weaving - a process in which you create tracks on the individuals head and sew the hair extensions on. This method is the most widely used in adding hair extensions. 2. Braiding - a process in which you add hair extensions by braiding them in. There are many types of braiding techniques such as cornrow but they vary from one beautician to another. 3. Fusion - a process in which the extended hair is attached directly to your own hair by a heated glue stick. In this method, an acrylic glue stick is placed inside a glue gun that heats and melts the glue. The hair extension and the glue are then attached directly onto the individual's hair. Bonding - A simple method of extending hair. A bonding glue is brushed or applied onto the extension hair and then applied to the root of the real hair. This is more of a temporary method of extending hair. U - Tip - a process in which a "U" shaped spot of glue is already on the tip of the hair ready to be attached by using the hair extension iron. I - Tip - a process in which an "I" shaped spot of glue is already on the tip of the hair ready to be attached by using the hair extension iron or with a Ring. With the Ring, there's no heat applied to the hair. Ring - X - one of the new processes in which the metal ring is already on the hair ready to attach using the Ring - Xer. It is very easy to apply and can be re-used. Hair for weaving is manufactured with and without the weft. Wefted hair extensions are held together with a band of fine threads. Wefted hair comes in two types: machine wefted and hand-tied. Due to the high cost of handmade products most extension hair is machine wefted in fine, medium or heavy wefts. Medium wefts are used for the majority of wefted hair extensions. Hand-tied wefted hair is more expensive but is often preferred due to its light weight - hand-tied hair is also more resistant to shedding. A weft is strands of hair that have been sewn on by machine or hand-tied along one edge to create a line of hair. The hand-tied hair is a much smaller and thinner weft than the machine weft. Hand-tied hair is also more secure because the weft has been individually made by hand, which means less shedding. Also, since the weft is less bulky it makes it flatter and less visible to give a more natural look. The hand-tied hair is a much smaller and thinner weft than the regular machine wefted hair. These wefts are handmade so the hair is more secure and allows longer wear per track than the regular machine wefts, and it dramatically reduces shedding too! The hand-tied weft also reduces the bulkiness of the track when it is weaved on, this allows the hair to flow much more freely and provide a lot more body. Hair without a weft is called BULK. Bulk hair is loose and is used primarily for strand bonding and braiding. Cornrow track extensions - cornrow tracking is the oldest and most widely used weaving technique. The technique is the same as with tracking only cornrow braids are used instead of weaving cord to form the tracks. Invisible Braiding (also called Tree Braiding) is a popular cornrow technique which allows weaved hair to be put in without threads or glues. Weaved hair is braided in with the client's hair in cornrowed braid layers, close to the scalp. As the braid goes in place, the weaved hair is separated from the natural hair in small sections and pulled away from the braid in a close pattern. The natural hair ends up fully braided and serves as a support for the weaved hair. Invisible braids are a great choice for anyone wanting to give their natural hair a break from chemicals. Invisible braids also go in fast but do not last as long as more traditional braids. This particular type of braid will therefore need to be redone more frequently, for this reason we recommend that synthetic hair be used invisible braiding. This type of hair has an adhesive on each strand section and is easily applied. The strands are made with precise amounts of hair to provide the best coverage with the minimum of bulk. Since the hair adhesive is already applied, less time is needed to apply the hair and the pieces are more evenly distributed for greater flexibility and a natural flow. IMPORTANT: All hair bonding products are considered professional products and require some level of skill to be used properly. Women and men of all races can wear hair extensions. Hair extensions have traditionally been worn by African-Amercians but more and more people from all ethnic backgrounds are using them as an alternative hair fashion. The number of people wearing hair extensions and feeling much better about themselves is growing all the time, you can also create highlights without coloring your own hair. Many individuals and hair stylists are using hair extensions to blend with their own hair to create highlights without dying and risking damage to it. Some hair extensions can only be applied by skilled salon beauticians but there are some hair extensions that can be applied at home. Good quality hair extensions can not only look just like real hair but they can feel the same way too. There are many reason why people wear hair extensions. It may be that you can only grow short hair and wish for longer hair. This has often been common with people with afro-curls but many now many more people are wearing hair extensions to either give them a new look, or to wear on a special occasion like a wedding. Hair extensions are also worn by people who have lost hair because of a medical condition or premature baldness. Some hair extensions require maintenance to keep them looking their best, just as real hair does but most hair extensions can be slept in, washed and cared for just like your own hair. You can also cut and style hair extensions to fit your own look. Hair extensions can be synthetic, natural or a combination of both. The best quality hair is human hair that comes from Asia where females have long, healthy, and strong hair. The best quality hair used for hair extensions also has to be virgin hair. Virgin hair is hair that has never been tainted by chemicals such as dyes or perm solutions. Is someone else´s hair hygienic to use? Raw hair is just hair that is taken from somebodies head. This should never be used for hair extensions for hygiene reasons. Hair used for extensions has been cleaned and sanitized so is perfectly hygienic. Yes, with many hair extensions you can, you should wear a swimming cap though as chlorine and salt water can dry hair out, but as long as you wash wash the hair thoroughly with moisturizing shampoo and a balsam conditione after swimming it shouldn't hurt too much. Human hair products can be styled just like your own hair. But just as too much heating can dry out your own hair; the same is true with extensions. Some synthetic hair extensions can also be heated but often only with low heat tools. No, not as long as it is done properly by a professional and the hair is properly cared for afterwards. Some hair extensions can be reused but it often depends on how the hair is taken care of, Some high quality hair extensions may be re-used if only the hair care instructions are followed. Hair extensions are held together with a band of fine threads, these are called wefts. Wefted hair comes can be machine or hand-tied. Hand-tied wefted hair is much better than machine wefted hair as it is smaller and thinner and more secure. Also, since the weft is less bulky it gives a more natural look. Bulk hair is extension hair without a weft. Bulk hair is loose therefore has to be weaved, bonded or braided. Normally 1/2 Ib (quarter of a kilo) of hair is required for a full head weave. Some people may require more others less. For just the back or the top of the head, 1/4lb (125 grammes) which is a bag of hair or a single bundle of hair. The quality of the hair and level of skill in processing affects the quality a lot. The best hair extensions are made with only the highest quality virgin Remy hair. It should not have been placed in acid and the cuticles on the hair should have been removed. The hair should also lay in the same direction which prevents knots, tangling and matting. Wash the hair when you shower and make sure it is hanging loose Use a good quality shampoo and conditioner. Remember that hair extensions don't benefit from the scalp's natural oils like growing hair so make sure it is regularly conditioned. After washing and conditioning apply a good leave-on spray conditioner to keep it fresh between washes, never use just plain water and if it gets wet in the rain apply some more and condition hair after exercise too as the salt in perspiration can be damaging. Loosen the hair every morning and before you go to bed. Avoid combing tightly curled styles and shake them out instead You can use a wide tooth comb or fingers to loosen wavy hair and a comb is fine for straighter hair extensions. Most hair extensions have been processed so shouldn't be coloured as it can damage the hair. If you need to make a colour match try coloring your natural hair to match the hair piece rather than the other way round. Or you could try combining two different colours of hair extension to obtain a more natural tone. However, if you feel you must dye the hair piece, start by depositing color from lighter to darker using non peroxide dyes. Test the colorant first with a small strand of hair. 1.Please make sure the WIG is INTACT and the LACE has NOT been cut first, and offer the pictures to let us confirm. No exchange for wig or lace cut units! 2.Please fill in the return & exchange form(included in divaswigs brochure) to request a return for exchange within 48 hours since yoou sign for your goods. No exchange for applications after 48 hours. 3.After the exchange request has been authorized , ship the wigs and the exchange form back to the address we gave you . You should offered us the receipt or the tracking No. of the return at the same time. 1.Custom cap size wig is not eligible for exchange. 2.You are responsible for the return shipping charge which is about $10 for U.S. customers. 3.Please allow 5-7 business days to process your exchange since the unit is delivered. 4.Any excess payment shall be refunded and deficiency shall be repaid for exchanged units. 5.15% restocking fee will be applied to the second-time exchange process. 6.No exchange for Synthetic lace front wigs,hair extensions,wig clearance. 7.We have the right to refuse to sign for the package if you send it back without our permission. All losses caused by it shall be borne by you. 1.Please make sure the WIG is INTACT and the LACE has NOT been cut first, and offer the pictures to let us confirm. No return for wig or lace cut units! 2.Please fill in the return & exchange form(included in divaswigs brochure) to request a return within 48 hours since yoou sign for your goods. No return for applications after 48 hours. 3.After the return request has been authorized , ship the wigs and the exchange form back to the address we gave you . You should offered us the receipt or the tracking No. of the return at the same time. 1.Custom cap size wig is not eligible for return. 2.$20 shipping fee for your order we ship to you at the beginning will be deducted from your payment. 3.You are responsible for the return shipping charge which is about $10 for U.S. customers. 4.Please allow 5-7 business days to process your refund since the unit is delivered. 5.No return for Synthetic lace front wigs,hair extensions,wig clearance. 6.We have the right to refuse to sign for the package if you send it back without our permission. All losses caused by it shall be borne by you. 2.After the repair request has been authorized , ship the wigs to the address we gave you. You should offered us the receipt or the tracking No. of the package at the same time. 3.Please include the message of your repair requirements in the package. 3.It's valid within THREE months since your unit is delivered. 5.You are also responsible for the return shipping charge which is about $10 for U.S. customers. The order can be freely changed within 36 hours after you placed the order. The order can be freely cancelled within 36 hours after you placed the order. week after the unit is in processing. week when the unit is in processing. Please note that once the order has been shipped out , it can no longer be cancelled.